Training that aims to greatly enhance strength, power and muscle size will call for higher intakes of protein, while elite endurance athletes also have a huge protein demand due to the muscle breakdown that can occur during such events. Whey protein is the best form of protein for muscle recovery, and the branched chain amino acids (BCAAs) plus glutamine are key in muscle protein synthesis. How much protein for exercise? Protein is necessary for strength and endurance adaptations. Following resistance and endurance exercise, protein increases the the rate of muscle protein synthesis (MPS) and the rate of muscle mass and strength gains, supporting muscle repair, growth and remodeling. The current literature suggests that a strength athlete will experience an increased sensitivity to protein feeding for at least 24 hours after exercise, but immediate consumption of 0.25g/kg bodyweight of rapidly absorbed protein will enhance MPS rates and drive the skeletal muscle hypertrophic response.2 So, benefit of protein consumption for recovery may be more in the timing than the quantity. Whey protein concentrate (WPC) – the protein form that remains after excess fluid, fat, carbohydrate and casein are removed from the whey fraction of dairy milk, high in protein fractions and BCAAs. Whey protein isolate (WPI) – is WPC further refined to remove fat and carbohydrate including lactose, giving 90% protein content but lower in bioactive compounds than WPC. Whey protein has rapid absorption and is generally used around time of exercise, facilitating protein uptake and usage by muscle tissue. WPC is 80% protein and contains lactose and about 5% fat. Whereas, WPI is 90% protein and has minimal lactose and fat. WPC generally takes a little longer to digest and absorb due to its additional macronutrient content, but therefore may be useful for athletes wanting to increase muscle size as opposed to maintaining a leaner muscle mass and body composition. Casein has a slow absorption rate and, high in glutamic acid, is mostly used to provide a steady supply of protein during the overnight fast when muscle repair is taking place or after resistance training to help maintain muscle mass, when consumed as part of a healthy and varied diet. Whey’s immune enhancing effects can be credited to its high levels of cysteine - an amino acid that helps the body produce and maintain adequate levels of the antioxidant glutathione (GSH), needed for a healthy immune system. Disease and stress deplete GSH levels and reduce the body’s ability to defend itself. In a number of studies, whey protein has demonstrated immune-enhancing and antimicrobial activity as well as free radical scavenging ability, particularly where there is deficiency of glutathione. Isolated whey protein fractions, including beta-lactoglobulin, alpha-lactalbumin, glycomacropeptide and immunoglobulin IgG have also demonstrated immune-enhancing functions giving whey the ability to act as an antioxidant, antiviral and antibacterial agent. Emerging evidence shows that consumption of different types of proteins can have different stimulatory effects on muscle synthesis; this may be particularly significant after resistance exercise. This effect may be due to differences in the fundamental amino acid composition of the protein and its rate of digestion. 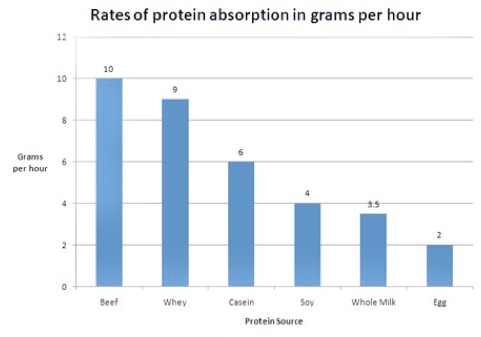 Milk proteins, specifically casein and whey, are the highest quality proteins and are quite different in terms of their rates of digestion and absorption. Paddon-Jones D, Westman E, Mattes RD, et al. Protein, weight management, and satiety. Am J Clin Nutr 2008;87(5):S1558-S1561. Aguirre N, van Loon LJ, Baar K. The role of amino acids in skeletal muscle adaptation to exercise. Nestle Nutr Inst Workshop Ser 2013;76:85-102. Marshall K. Therapeutic applications of whey protein. Altern Med Rev 2004;9(2):136-156. 2. Shah NP. Effects of milk-derived bioactives: an overview. Br J Nutr 2000;84:S3-S10. Phillips SM, Tang JE, Moore DR. The role of milk- and soy-based protein in support of muscle protein synthesis and muscle protein accretion in young and elderly persons. J Am Coll Nutr 2009;28(4):343-54. Skolnik H, Chernus A. Nutrient timing for peak performance. Human Kinetics, 2010.